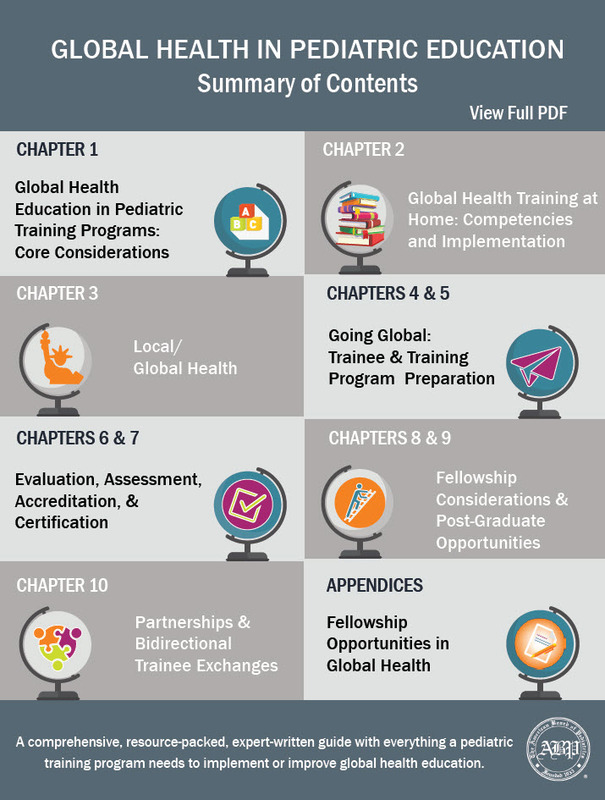 Global Health in Pediatric Education: An Implementation Guide for Program Directors is a comprehensive, practical resource for incorporating global health education into pediatric training programs. We've outlined the documents purpose, value and highlights below. Additionally, each chapter's resources and templates can be found within the Appendices. There are multiple opportunities to incorporate GH education into a pediatric training framework, requiring variable levels of resources. Definitions of residency GH tracks vary. A draft definition is provided in this section, as well as guidance for GH faculty mentors, track directors, and track program coordinators. GH-specific objectives can be applied to all competency domains (patient care, medical knowledge, practice-based learning and improvement, interpersonal and communication skills, professionalism, and systems-based practice). Examples are offered in this section for both Tier 1 (all trainees) and Tier 2 learners (trainees on GH electives). For trainees enrolled in GH tracks (Tier 3), programs are encouraged to develop additional objectives that are pertinent to the content of their GH track. This section provides the “how to” for educators seeking to integrate GH into their curriculum, including: 1) Strategies for incorporating GH-specific objectives into existing and new residency curricula, 2) High-yield educational resources currently available (online and print), and 3) Considerations for mapping GH education to board specifications. GH emphasizes the health of all people, both internationally and locally. Local GH topics encourage trainees to “think globally, act locally” in the care of underserved children and migrant populations. Unique competencies are required for pediatricians to care for local global pediatric populations, including refugees, immigrants, internationally adopted children, and victims of human trafficking. Competency-based objectives for local GH training programs are offered in this chapter. Challenges inherent to the development of community partnerships need to be mindfully considered and discussed with institutions, partners, and trainees. Training programs that offer GH electives need to ensure that a minimum infrastructure is in place to support an ethically sound, safe training experience with appropriate pre-departure, on-site, and post-return support. A comprehensive checklist and programmatic recommendations are provided in this section. Identifying safe, ethically sound elective options for trainees is difficult and will likely require departmental investment in the development of training partnerships and/or trainee investment in elective fees. Debriefing and evaluation are important components of the GH elective that are frequently overlooked; suggestions for both are offered. There are many considerations for trainee preparation for GH electives, including logistics, personal motivations, safety, health, emergencies, ethics, sustainability, resources, culture, culture shock, language, and professionalism. This chapter offers a “top ten” list to help structure pre-departure training and mentorship. Culture shock is frequently experienced by trainees during GH electives, and the phenomenon is summarized here in an effort to optimize pre-departure training and on-site mentorship. There are four areas of assessment and evaluation to consider with GH training: 1) assessment of the trainee; 2) evaluation of the GH training program; 3) evaluation of the GH elective; and 4) evaluation of outcomes of the GH training program. Assessment of trainee performance during a GH elective can be difficult to obtain due to time limitations of the host supervisor as well as the length of standard stateside assessment forms. Innovative strategies for obtaining assessment data surrounding the GH elective and from the host supervisor are offered. At present, any individuals who take more than 6 months of clinical electives away from a training program (such as a GH elective) require review and approval by the ABP, unless they are enrolled in an ACGME-approved GH program. GH Tracks are usually developed within the confines of standard residency training, and individuals enrolled in tracks do not require ABP approval unless they impinge on the aforementioned 6-month rule. Although the ACGME and ABP expect that almost all clinical training in the United States will be supervised by board-certified or board-eligible providers, this is not feasible nor required during GH electives. However, programs are expected to seek supervisors who routinely provide health care to infants and children. There are many opportunities to participate in GH during fellowship training. A spectrum from electives abroad to formal GH fellowships within subspecialty and general pediatrics fellowships are available. Examples of GH training opportunities and important information for fellowship program directors are offered in this section. For Tier 3 learners, there are many post-graduate opportunities in global health within the realms of clinical practice, policy, advocacy, research, and education. Examples are offered in this section. It is important to strive for mutually beneficial partnerships with global colleagues with agreement upon and alignment of goals, clear expectations, and frequent communication. For some global partners, that mutuality may include the establishment of bidirectional trainee and faculty exchanges, which confer many known benefits to both partners as summarized in this chapter. Obstacles to bidirectional exchange implementation will vary at each institution. Common challenges are summarized here, and solutions as well as implementation strategies are offered, including the establishment of a stateside consortium to support global partnerships.